Relevant Musings: Big Soda Ban in NY Blocked… Win or Loss for New Yorkers? Justice Milton A. Tingling Jr. of State Supreme Court in Manhattan blocks New York City’s ban on big sugary drinks. Picture this… Your child’s school superintendent holds a meeting for parents and informs you that the school cafeterias have been stocked with junk food, and that the kids are consuming mainly cookies and doughnuts and soda. That’s making them fat and giving them diabetes and will likely kill them at an early age. Therefore, the superintendent is going to be making some changes to have less garbage and more healthy stuff available to them. In other words, the superintendent wants to improve the food environment. NY was about to take a step toward that but that was prevented at the last minute. Several sources are speculating about how deeply and exactly who reached into the pockets of the beverage industry. Bloomberg appears to be taking it in stride and vows to appeal. People tend to eat whatever is in front of us. That means the kind of food or drink and the amount of food or drink. Basically, we eat and drink tons more of what is easily accessible, and we eat and drink however much we have in front of us. There is tons of data proving this. 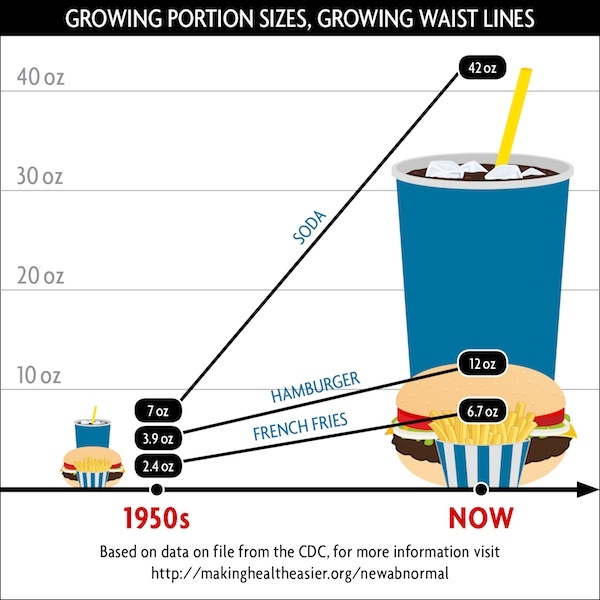 No coincidence that portion sizes and waistlines have expanded in almost perfect parallel in recent decades. Sugary beverages such as regular soda are a source of tons of (at best) completely empty calories. 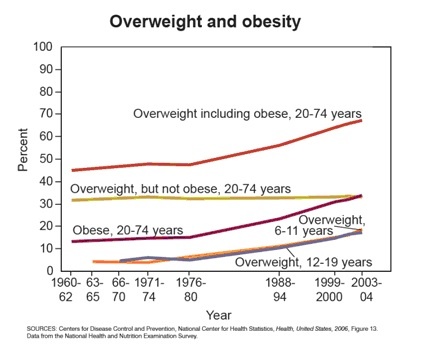 Excess calories make us fat and unhealthy. If 16oz bottles are readily available, we’ll drink 16oz and be satisfied with that. If 20oz bottles are readily available, we’ll drink 20oz and be no more satisfied but get an extra 47 calories (and 13g of sugar). Doesn’t sound like much? Let’s say a person typically gets a 20oz soda with lunch (1 soda per day). Compared to a person who drinks a 16oz soda every day (I wouldn’t recommend either), a person who drinks a 20oz soda will ingest an extra 17,155 calories over one year, which is an extra 4.9 pounds!!!!! Check my math: 47 calories in 4oz of soda. 47 x 365 = 17,155. 3,500 calories = 1lb. 17,155 / 3,500 = 4.9. Yep, for someone who drinks a soda per day, keeping the extra 4oz that they wouldn’t miss anyway gives them an extra 5lbs of flab every year. The big soda ban was about making way too much soda less readily available in a form that promotes immediate consumption. It was a small change toward a less toxic food environment. It was going to benefit the health of literally millions of people. The cost? Some restaurants have to buy new glasses and 16oz instead of 20oz bottles of coke in NY. Some speculate that beverage industry would have lost some money and may have invested in an attempt to have the ban blocked. We may never know for sure why the ban was blocked but we do know for sure it was not the best outcome in terms of our health and that of our children.